We knew the high point (literally) of our trip to China would be a visit to the Longji Rice Terraces in North Guangxi Province. We just didn’t know HOW to do it, so we put the idea aside and continued on with other round the world planning and arrangements. Months later, we read a travel blog about rafting on the Li River with the guide, Lilly Lu. We looked at Lilly’s website and discovered that she also took visitors to visit the rice terraces! Perfect! We booked a two-day trip with Lilly and her driver. We made a rookie mistake by planning our trip during Golden Week, an important holiday in China. This (major) detail had slipped by us but came to light when we tried to reserve a room in Ping’An three months in advance. On every attempt on our part to book a room, we heard the same thing: no, no, no. We wrote Lilly to explain that we were distressed to have to cancel our visit, because no rooms were available. 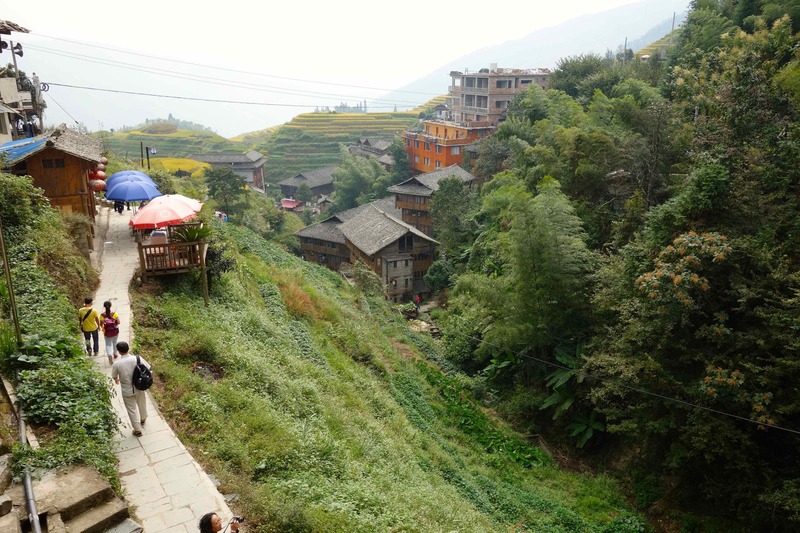 Almost immediately, we heard back from Longji One Hotel that a room would be made available since the innkeeper knew Lilly. We celebrated (and ignored the fact that the room was way over our budget). 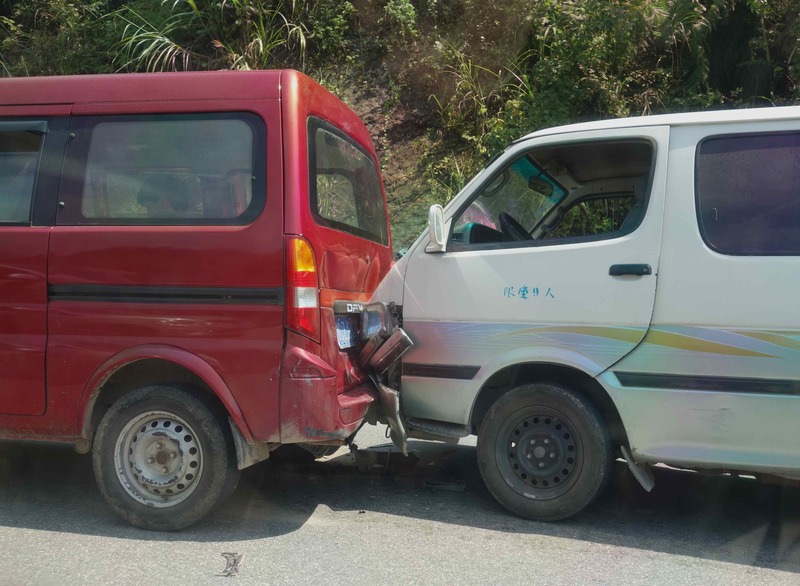 Lilly and her driver took us 2.5 hours from Guilin, and, as we got closer to our Longji Rice Terraces destination, traffic picked up, the roads narrowed, and the curves increased in number and tightened through the mountains. We counted nine cars damaged in accidents in just a few miles. When an oncoming car on a curve barely missed us, our driver saved us from being car ten. He drove very well. We arrived to discover the usual parking lot for our destination – from which Ping’An is a 20 minute walk — was already full at 11am. 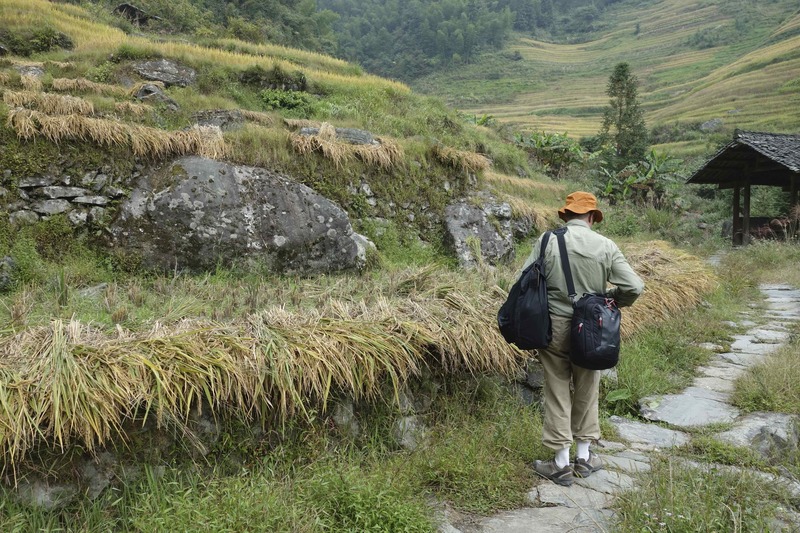 Would we ever see the rice terraces? Lilly suggested that we go to a distant parking area in another village and then make our way to Ping’An from there – an 80-minute walk. No problem! We like to walk, and this walk would be scenic. Fortuitously, we had already prepared a couple of daypacks with the intention of leaving our suitcases in the car for the night. The driver was left to keep an eye on the car as Lilly and we walked, packs slung over shoulders, into the very warm and humid day. 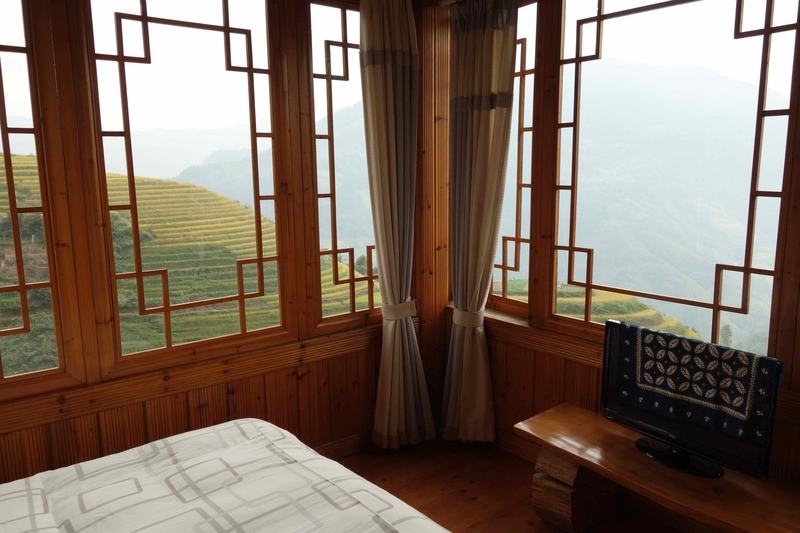 This entry was posted in Around-the World - 2013-14, China and tagged Golden Week, Li River, Lilly Lu, Longji One Hotel, Longji Rice Terraces, North Guangxi Province, Ping’An, travel. Bookmark the permalink. Wow! What an adventure right out of the gate! I am so excited for you! Thx for stopping by and accompanying us on our journey. So far it just gets better as we move along, and we haven’t needed a bungee jump or white water to have adventure. Point well said and well taken … We have taken plenty of photos of ourselves. We usually don’t post them, and our 3 kids never ask to see them. Maybe they will, as you say, look at them in future. I was wondering where you would be during Golden Week. It is the worst time to travel in China – note we went to Greece! Glad to know you were overcoming the issues. Read your blog posts about Greece. It looked wonderful. We found it interesting to be part of that Golden Week migration, but we wouldn’t recommend it nor do it again.